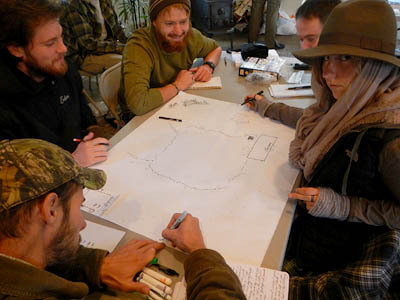 Wilderness survival training continued with week 3 of the Alderleaf Wilderness Certification Program including lessons on survival skills in fire making, shelter building and in studying bird language. Students learned to take care of 2 of the major wilderness survival priorities: fire and shelter. Students learned to construct both debris huts and lean-to shelters at our primitive camp. 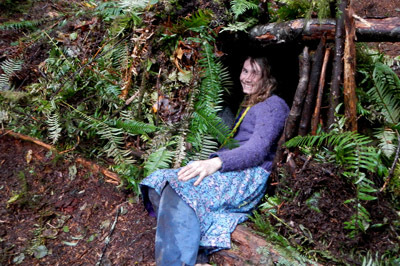 They used the natural forest debris to make well-insulted shelters. 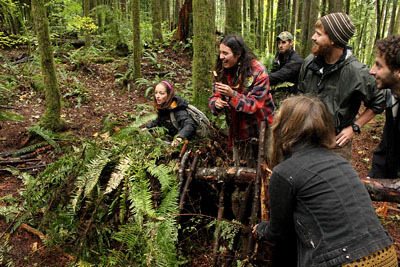 Here you can see a handful of students having a great time putting together a debris hut. Here student Ricky takes a look into the debris hut to check for holes and help the group decide where to stick more debris. Fire is one of the other major wilderness survival priorities. 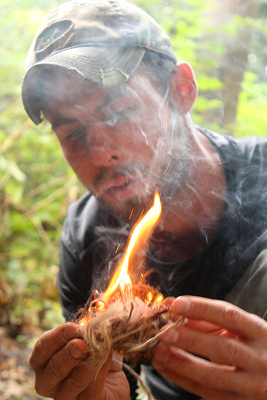 Here one of our students gets his first coal and first fire using the bow and drill method. It feels good to make fire the old way! Week 3 also included our first bird language studies day of the year. After learning some of the fundamentals of bird language, students did an hour long sit that included observing and listening to the lives of the birds around Alderleaf. Afterwards, they came together visually and represented their observations in the form of a map. This helped piece together a cohesive story of what occurred in the field. In this case, a predator (likely a bobcat) walked near each group of students and set of a chain of alarms. 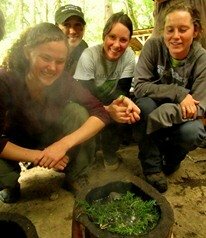 Learn about the Alderleaf Wilderness Certification Program, our in-depth, nine-month course that trains students to teach and apply wilderness survival, permaculture, ethnobotany, wildlife tracking, and outdoor leadership skills.